Harare – It’s everyone’s election. A record 5.5 million registered voters – 23 presidential candidates – and 128 political parties. Two frontrunners coming via power grab. For Zanu-PF – Emmerson Mnangagwa facilitated his elevation through the gun. The 2017 bloodless coup was endorsed by the masses. Nelson Chamisa replaced the late Morgan Tsvangirai – albeit a flurry of protests from his MDC presidium. A split has temporarily deciphered the impasse. A record 5 million voters are slated to cast their ballots – 250 000 are rumoured to be ghost – though the Zimbabwe Electoral Commission (ZEC) maintains its independent innocence. The 2018 elections in Zimbabwe will set new levels – come July 30. The 23 presidential candidates comprise of an artiste, clergyman and advocates. Five female participates have made the final cut – a first for the country. Turai Bryan Mteki seeks to suspend his sculpturing aptitudes for the higher office. His heavy dreadlocks, white tinted hair betrays his creative abilities rather than a political calling. Professor Lovermore Madhuku – a law expert fancies his odds for the umpteenth time. Chamisa and Mnangagwa hold related law backgrounds. 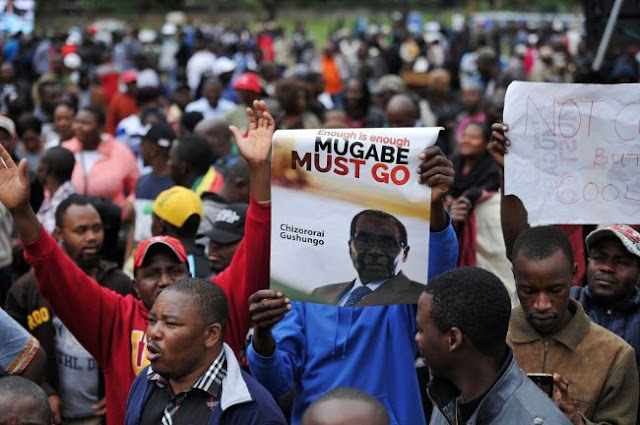 Robert Mugabe – with his comradeship title deleted by his party cadres still remains politically relevant. The former president’s covert project is fronted by a retired army official – Ambrose Mutinhiri. Mugabe and his wife Grace’s influence hovers constantly. Chamisa boasts of having solicited Mugabe’s vote, while the army censures him for linking with the enemy. Could we see the return of Grace disguised as an opposition option? Even exiled Professor Jonathan Moyo is enjoying a blast through his buzzing twitter account laced with retribution leaks. The former government spin doctor claims to have been struck by the light to fight for the opposition’s cause. A bandwagon of trolls has become party of his online family. The state broadcaster – Zimbabwe Broadcasting Corporation (ZBC) has softened its editorial stance. Opposition politics has been offered generous space on television – though Zanu-PF commands a protracted airplay as before. School children have not been spared either. The ruling party has been guilt of dragging innocent souls to their rallies to swell up the numbers. As before, the ruling party has blamed this on western-funded political parties. With swelling figures, the displaced Zanu-PF G40 cabal has infiltrated the party, accused of assassination attempt, targeting Mnangagwa at a recent rally. After an indefinite embargo by Mugabe regime in preceding elections, European Union (EU) observers have returned to Harare, Their press statement, like before paints a gloomy picture of the impending plebiscite. African Union (AU) and SADC observers have trooped in to witness the new era. On 30 July – every Tom, Harry and Marry will have a chance to make history during the harmonised elections.